'Bratislavan' (Anton Mego, R. 2010). Seedling# AM-95/0085-2. TB, 39" (100 cm). Midseason bloom. 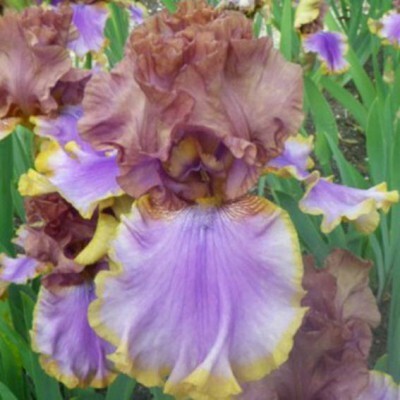 Standards smoky yellow-caramel tinted violet; style arms yellow caramel, violet midrib; falls light lavender-blue, yellow border; beards yellow in throat, light yellow in middle, lavender blue at end; slight sweet fragrance. 'Honky Tonk Blues' X 'Rustler'.